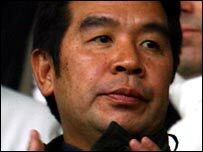 Prospective new owner Carson Yeung insisted he had offered his full backing to Steve Bruce after meeting with the Birmingham manager. Bruce has been frustrated that his new contract was put on hold due to Yeung's protracted takeover of the club. But Yeung told the Daily Mirror: "I have a lot of faith in Steve and I will give him my full support. "He knows it is not our fault about his contract and we will talk about new terms when we take over." Yeung remains confident a full buy-out of Birmingham will be completed in accordance with current co-owner David Sullivan's deadline of the end of the year. And the Hong Kong-based billionaire has also told Bruce he will provide financial backing to boost his current playing squad. "He recommended some players for us and I told him I can do it for him," Yeung said. "When I complete the general offer for the rest of the shares I will help him financially. "After the general offer for the remaining shares he will stay on as manager and I am delighted with our meeting." Yeung added: "There was a misunderstanding about his contract but we have discussed it face-to-face and he understands we didn't stop anything. "We want the club steady, with Steve and managing director Karren Brady in charge."